An electrician was resetting a 400A 1000V circuit breaker in a low voltage switchboard on a mine’s underground 11kV/1000V substation, when an arc flash and blast left him with serious burns. The circuit breaker supplied both a 75 kW fan starter circuit and a water pump station circuit. 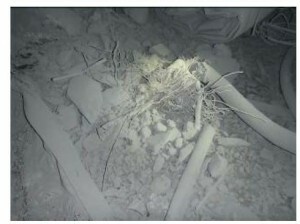 The fan starter’s steel wire armoured cable was damaged by blasting from the mining operation, shorting the three phase conductors to earth (see below). The circuit breaker had tripped. The electrician however was trying to restore the power supply to the other circuit – the water pump station. At this mine, different groups of electrical maintenance personnel have their own areas of responsibility and the electrician was unaware of the damaged fan starter circuit as it was the responsibility of another group. Nor was he fully aware of requirements for arc flash safety clothing and mask during resetting or isolating substation circuit breakers. It appears he stood in front of the switchboard to reset the circuit breaker. 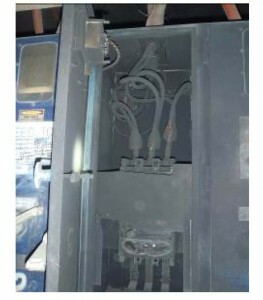 An arc flash and blast then blew the door open (see below). The electrician received serious burns to the upper part of his body and both sides of his face. The electrical fault was cleared by overcurrent protection on the 11kV side of the substation. The circuit breaker was not fitted with phase barriers to avoid arcing between the phases. Contamination inside the enclosures due to the underground environment was aggravated by high humidity. 1. Ensure enclosures are fit for purpose and an arc flash assessment is taken into account when determining that risks are at acceptable levels. 2. Install any arc barriers provided by the circuit breaker manufacturer. 3. Ensure circuit breaker cable connections are adequately insulated with materials appropriate for the environment and application. 4. Regular maintenance and inspection of substations and switchboards at the mine must effectively monitor the safety of the electrical installation and its protective features (For example. protection settings, exposed live parts and contamination). 5. Avoid standing in front of circuit breakers and switches on switchboards when operating them, to avoid the potential projection of arc flashes or blasts. 6. Wear fit for purpose personal protective equipment during electrical switching activities. 7. Maintenance personnel must be competent and aware of the safety procedures when performing electrical work in substations and switchboards. © State of Queensland, Department of Natural Resources and Mines, 2014.